Eyewitness video shows workers plunging knives into the throats of conscious lambs and starting to skin them while they’re still alive and moving. No matter where wool comes from, whether it’s “responsibly sourced” or from a “sustainable” farm, it’s the needless product of a cruel business. There is simply no way to raise and kill animals for the mass market in a humane way. To protect sheep from this abuse, please, refuse to buy wool. It’s easy to check the label when you’re shopping. If it says “wool,” leave it on the shelf. Please also ask Patagonia to drop wool immediately in favor of animal-friendly materials. The company’s claim that its wool is “responsibly sourced” misleads caring consumers. Pataonia online contact info... Call, email, post on their site and Facebook pages, etc. A gut-churning PETA video exposé reveals that life is hell for lambs and other sheep exploited for so-called “responsibly sourced” wool on so-called “sustainable” farms. A witness found workers in Argentina hacking into fully conscious lambs, starting to skin some of them while they were still alive and kicking, and otherwise mutilating, abusing, and neglecting lambs and sheep on farms in the Ovis 21 network—Patagonia’s wool supplier. 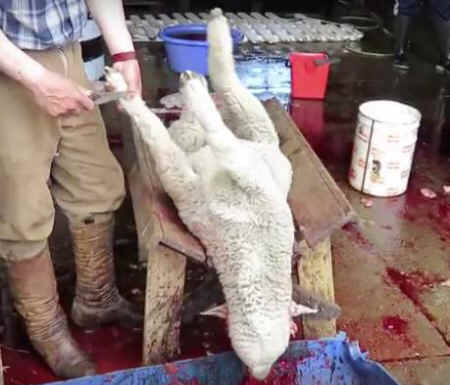 Workers picked up gentle lambs and—while they were fully conscious—tied their legs together, plunged knives into their throats, and sawed through their necks. Blood poured from the wounds as they kicked with their only free leg. Workers then snapped their heads backwards, apparently trying to break their necks. Even after all that, some of the lambs still managed to cry out and gasp. Minutes later, some lambs were still alive and kicking when a worker drove a knife into their legs to start skinning them. Eventually, they were hacked apart. Their organs were carved out of their bodies and their severed heads dumped into a bloody tub. All this happened in full view of other lambs. They were just feet away and cried out in what must have been terror and severe distress. Older sheep—used for their wool, then no longer wanted—were lined up, tackled, and dragged away to be shipped to slaughter. 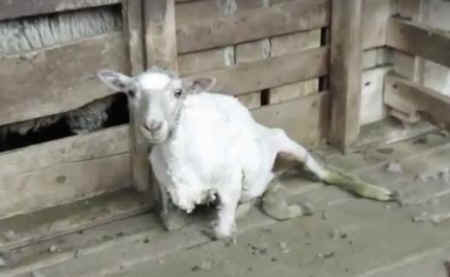 As is common in the wool industry, lambs who were kept for their wool endured hideous mutilations—all without anesthetics or any pain relief. A manager used a tool similar to pliers to cut out pieces of the lambs’ sensitive ears, which dripped with blood onto his hands. He wiped the blood off on one of the lambs. He also put a tight ring around one lamb’s scrotum, which is extremely painful. These rings cut off the blood supply to the testicles, which are expected to shrivel and die over the course of several weeks. Then, another worker cut off their tails. Lambs are prey animals who suffer in silence, rather than drawing attention to themselves and attracting further predation, but they struggled as much as they could while the workers restrained them. They were then unceremoniously dumped onto the ground, where they huddled together as blood dripped from their ears and the stumps of their tails. The man just tossed their mutilated tails onto the ground.